The legislature and the Governor blame one another for a situation that left the state budget in need of additional legislative action to balance it. On Friday the legislature passed two bills meant to be the final step. Each of those bills includes a provision to create the Missouri Senior Services Protection Fund. That fund would receive $55.1 million from General Revenue, which is coming in to the state coffers ahead of projections, and use it to support four programs. Those are First Steps, a program for children with developmental disabilities, health care for the blind, medical clinics that treat low-income patients and special initiatives for early childhood. Those programs were to have been funded by the repeal of a tax credit for low-income seniors living in rental housing, the passage of which Governor Jay Nixon and the House and Senate all built into their budget proposals. However, after the House had approved its budget plan and while the Senate was debating its plan, Nixon said he would veto that bill if it was not passed as part of a larger tax credit reform package. It was passed as a stand-alone and Nixon did veto it. The two bills passed by the legislature on Friday are now awaiting the Governor’s action. One of them, HB 116, would one would allow second-class counties to be audited by the State Auditor at any time and specifies those counties must cover the expense of those audits. It would also have details about budget cuts made by a governor and local bond issuances be posted on a state website. 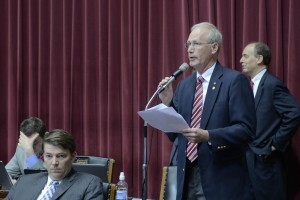 The second, HB 986, would create an interim committee to study Medicaid expansion and reform in Missouri, and would extend the Ticket to Work program’s expiration date. That program provides Medicaid coverage to disabled individuals who want to work but risk losing government health care by earning too much.